The Verdict: When the this parma first came out I raised an eyebrow at the salad portion because, to be frank, I did not think it looked very good. Whilst eating the Archive Beer Boutique parma it became apparent that my impression was correct and the weakest link in this meal was indeed its salad. All of the other elements were difficult to fault. Chicken: Don’t be fooled by how small this chicken piece looks in the photo as it was quite a large portion. It was also very well cooked and crumbed nicely. Tomato Sauce: The Archive parma’s tomato sauce was right up there with the best tomato sauce I have trialed during this search for Brisbane’s Best Parma. There was a large amount of it and it tasted great. Ham: Whilst the sauce was up there with some of the best so far, the ham was the real hero of this dish. Thick slices of ham which covered almost all of the chicken and complimented all of the other elements perfectly taste wise equal exactly how the ham on a chicken parmigiana ought be! Cheese: The cheese was perfectly melted and had a nice mix of herbs through it. It covered the chicken piece very well. Side Dishes: The chips were close to perfect. They were well cooked, well seasoned and tasted great. The salad was a major let down. When it came out I suspected that cling wrap had just been taken off it and it was fresh from the fridge; so it proved in the eating. It was small and fairly tasteless. Presentation: This chicken parmigiana was served on a massive plate. It was bizarre then that the salad was served in a small bowl on the plate and that some of the chicken was resting on the chips. Venue: Archive Beer Boutique is on Boundary Road in West End. It has a large amount of beers on tap and a bistro with a broad menu. Tuesday night is trivia night at Archive. My parma cost $23. The final word: The terrible photo I took made this chicken parmigiana look worse than it actually was. All of the elements but for the salad were quite good and if the salad had have met that standard this meal might have been a challenger for the “Robert” Parma. However it was not be! 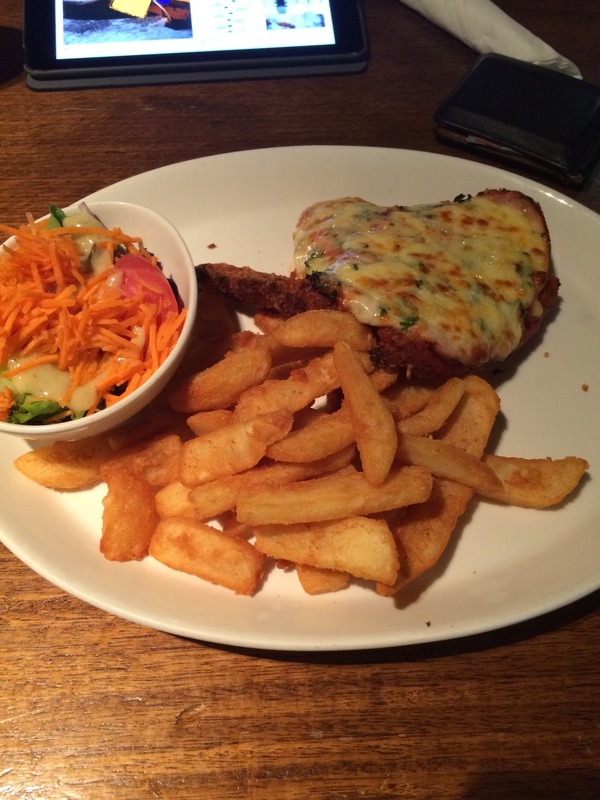 This entry was posted in Uncategorized and tagged Archive Beer Boutique, Brisbane, brisbane best parma, brisbane food, chicken, chicken parmigiana, food. Bookmark the permalink. 1 Response to Parma Number 39: Archive Beer Boutique … don’t let the photo fool you! You left out one crucial fact: $10 schnitzels on Sundays, upgraded to parma for an extra $2.